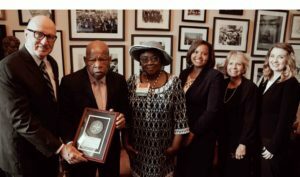 WASHINGTON – October 24, 2017 – Past SOPHE President, Dr. David Birch, presented Rep. John Lewis (D-GA) with SOPHE’s highest honor to a non-member who has made significant and lasting contributions to health education and the public’s health. “Congressman John Lewis, It is my distinct honor and privilege to be here with you today to present the Society for Public Health Education’s 2017 Honorary Fellow Award. This is the Society’s highest honor to a non-member who has made significant and lasting contributions to health education and the public’s health. Today, our SOPHE leadership and 4,000 members throughout the country honor you for your extraordinary commitment to advancing our nation’s civil rights, social justice and peane-half a century. These fundamental principles form the basis of SOPHE’s core values of promoting the health of all people and non-discrimination — including the belief that quality health care is a fundamental human right for all and not a privilege for selected few. From the early days of the Civil Rights Movement — to contemporary fights for universal access to health care — your courageous, sustained leadership has been a great beacon light of hope to millions of people to end discrimination based on race, color or gender identity. SOPHE stands with you in fighting to realize the dream of the late great Dr. Martin Luther King Junior – and the true promises of democracy are realized for all people across the nation.